MIDDLETOWN, Pa. (AP) — It was about 8 a.m. on a Wednesday, and Lou Braasch, program director of WKBO radio in Harrisburg, Pa., was holding down the morning DJ slot under his on-air name Dan Steele. The two-way radio, linking the studio with its traffic reporter, crackled. The station's chief traffic reporter, Captain Dave Edwards, told Braasch something was happening at Three Mile Island. There had been no official notification of what was happening, no public alarm. One of Edwards' traffic watchers had noticed some activity around the plant, just a few miles away, near Middletown, and had heard some chatter on the police scanner about something going on at the nuclear power plant. Braasch connected Edwards with Mike Pintek, the station's news director. Pintek said he'd check it out. He looked up a phone number for Metropolitan Edison at Three Mile Island and dialed. (Met-Ed owned and operated the plant then.) The number turned out to be the direct line into the control room for TMI's unit 2 reactor. The man who answered the phone told Pintek, "I can't talk right now; we got stuff going on." Pintek was transferred to other people. He explained that the station was going to go on the air with the story. He was told that "everything was under control." The short version of events that resulted in the partial meltdown of the unit 2 reactor is that mechanical malfunctions, coupled with human error, led to the reactor being starved of coolant, leading the fuel in the reactor to begin melting. The fear was that once the radioactive fuel began melting, nothing could contain it, and it would melt through the steel vessel housing the reactor and not stop until it hit the ground-water table, causing an explosion of radioactive steam. This was the so-called China Syndrome, a fanciful way of saying that the molten material would pass through the earth all the way to China. Coincidentally, just 12 days before, a movie studio released a thriller titled "The China Syndrome," featuring a fictitious accident at a California nuclear power plant. At one point in the film, one character, an expert on nuclear power, intones that a meltdown could "render an area the size of Pennsylvania uninhabitable." Beginning at 4 a.m. on March 28, 1979, when a valve malfunctioned and the core of the unit 2 reactor began melting, that was the fear. And it was right in the middle of Pennsylvania. A day later, Layman felt ill. She thought it was the flu. She hadn't been aware that something had happened at TMI, but like just about everybody else in the region, she was unclear on the details. The initial reports of the accident were confusing, to say the least. Met-Ed downplayed the accident, even as others were raising alarms. At some point, an emergency vehicle trundled down her street and over loudspeakers, informed residents that pregnant women and young children should leave the area. She packed up her daughter and, with the clothes on her back, she drove to her mother's house in Manchester. From there, she went to an aunt's place in Hanover at the other end of the county, where she stayed and watched as the news grew worse and she began to fear that she'd never be able to return home. "It felt like the 'Twilight Zone,'" she said. "It was unreal." That is how a lot of those who lived through the accident describe the experience - unreal. For a few days, perhaps a few weeks, thousands fled the area, unsure that they'd ever be able to return. Among those was Mart Goodling. He was working at a bank in Middletown when news of the accident broke. Nobody, he said, knew what to do. "Nobody knew what was going on," he said recently as he ate breakfast at the Brownstone Café on the main drag in town. "We thought the best thing to do was leave." He drove to his son's school and then home and then to his hunting cabin in Potter County, 185 miles away. He took his hunting rifles and fishing gear, thinking that he and his family might have to live off the land for a while. "It scared the hell out of people." he said. The accident itself was bad, destroying the reactor and leading to the release of radioactive steam - damage that seems to pale in light of subsequent, devastating accidents at nuclear power plants in Chernobyl in the Ukraine and Fukushima in Japan. There are those who dispute those claims, citing anecdotal evidence to suggest a spike in cancers in the area downwind from the plant, within what had become known as the "plume" of contaminants released by the accident. Layman is among those. She has suffered some health consequences that she attributes to radiation exposure - thyroid problems, infertility, brain lesions - and she knows a lot of her neighbors who have battled cancer in the years after the accident. She and others in the group believe that the government and the industry never told the truth about how much radiation was released. "From being there and seeing how they did not know anything at the time," she said, "it put doubt in my mind that they knew what's going on." The researchers point out that doesn't mean the cancer was caused by exposure during the TMI accident; Pennsylvania has one of the highest rates of thyroid cancer in the United States, most of which are not attributed to radiation exposure. The study, researchers pointed out, was limited, and a larger, follow-up study is planned. "It validates the stories I've heard," Layman said. "I don't want the industry to say no one was harmed by the accident. I don't want my great-great-grandchildren hearing that no one was harmed." Braasch had left the area for a job interview in San Antonio, Texas, two days after the accident. His wife and sons went to stay with her parents in New Jersey. When he returned home that weekend, he recalled he couldn't get a taxi at the airport, the cabbies wouldn't drive into the area. He went to work and recalled asking Pintek, "What's going on?" Pintek responded, "I have made peace, and I'm prepared to meet my maker." Braasch, now 72, got the job in San Antonio but returned to Middletown when he and his wife couldn't sell their home. He stayed in the region, working for decades in radio before his retirement. Pintek died of pancreatic cancer last September at age 65. For residents of the region, it was a terrifying few days. The fear was mollified a few days after the accident when then-President Jimmy Carter, trained as a nuclear engineer in the Navy, visited the plant and calmed the tattered nerves of residents. As the weeks, months and years passed, TMI faded into the background. 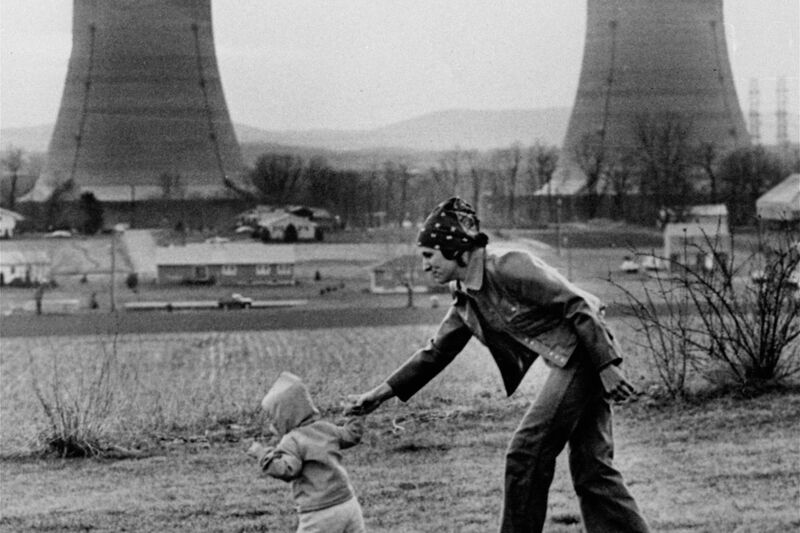 The plant's unit 1 reactor, which was shut down at the time of the accident for maintenance, was restarted, and the familiar plumes of steam once again wafted from the cooling towers. Unit 2 was cleaned up and shut down, its cooling towers remain, but are dormant. For a few years, TMI was a tourist destination, a stop as visitors to central Pennsylvania made their way from Hershey to Gettysburg. That has dropped off, residents said. The visitors center at TMI has been closed for a number of years, and TMI had, until news of its possible closure, faded into the background. "It's just there," said Brian Lewis, 28, manager of the Nuclear Bean coffee shop housed in the former Elks Club building on the main street in Middletown. The name of the shop is homage to the town's primary claim to fame. "Middletown needed a coffee shop, and we thought, 'What should we call it?' We thought it'd be cool to play on TMI," he said. "We get people yelling at us about dragging up what happened," Lewis said. "But it was just for fun. It was a fun name." A block away, at the Brownstone Café, Alexis Carns, the front desk manager who was born a year after the accident, said, "For the people who live here, it's just kind of a part of the landscape."